This is a hand crafted imitation (this product is not indian made) native american indian medicine man head piece. This medicine man head piece is made out of natural horns (dyed black), rabbit skin and coyote tails! The head piece is adorned with hand selected white imitation eagle feathers with black tips and bead work. 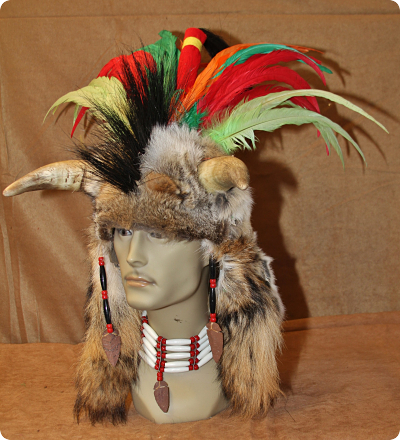 This medicine man head piece is perfect for costumes, parades, boy scouts or collectors. Note: Fur color and beadwork designs may vary from those shown. This is a hand crafted imitation (this product is not indian made) native american indian medicine man head piece. 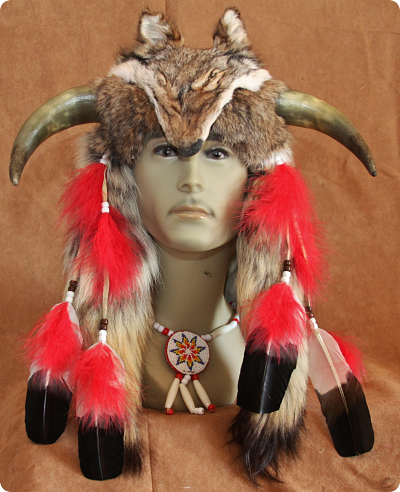 This medicine man head piece is made out of natural horns, rabbit skin and coyote face! The head piece is adorned with hand selected white imitation eagle feathers with black tips and bead work. This is a hand crafted imitation (this product is not indian made) native american indian medicine man head piece. 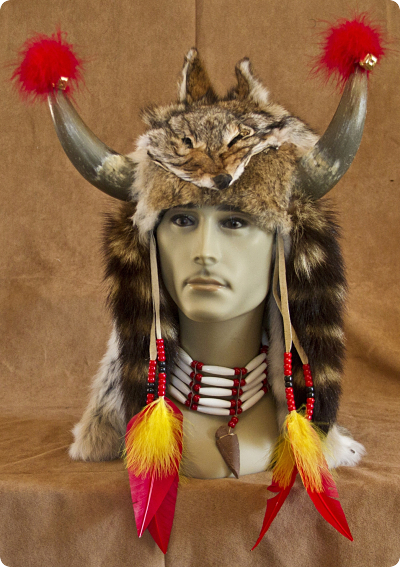 This medicine man head piece is made out of natural horns, rabbit skin, raccoon tails and a coyote face! The head piece is adorned with hand selected red turkey feathers, red and yellow trim and bead work. This is a hand crafted imitation (this product is not indian made) native american indian medicine man head piece. 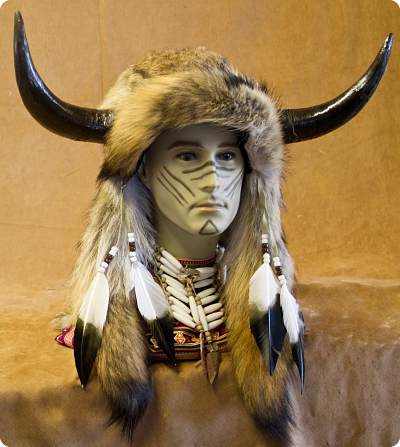 This medicine man head piece is made out of natural horns and rabbit skin. The head piece is adorned with ribbons and beadwork. Note: Fur color may vary from those shown. This is a hand crafted imitation (this product is not indian made) native american indian medicine man head piece. 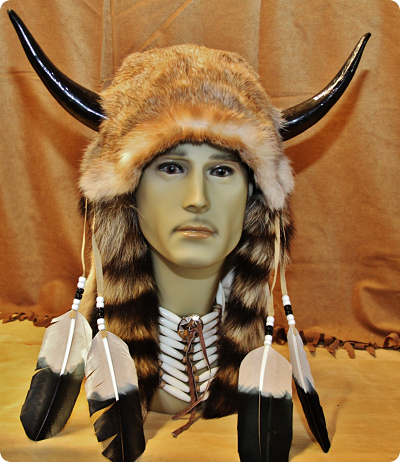 This medicine man head piece is made out of natural horns (dyed black), rabbit skin and raccoon tails! The head piece is adorned with hand selected white imitation eagle feathers with black tips and bead work. This is a hand crafted imitation (this product is not indian made) native american indian medicine man head piece. 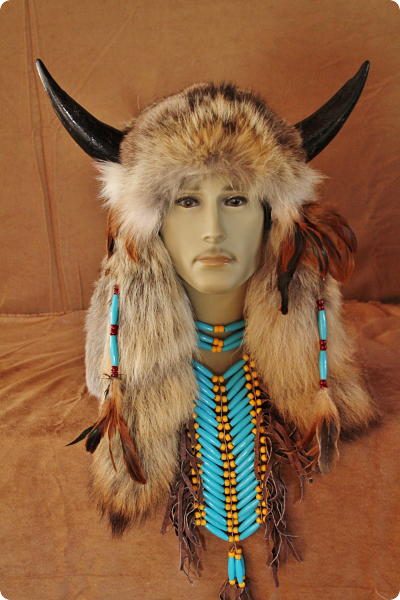 This medicine man head piece is made out of natural horns, rabbit skin, coyote tails and a coyote face! The head piece is adorned with hand selected white imitation eagle feathers with black tips, red trim and bead work. This is a hand crafted imitation (this product is not indian made) native american indian medicine man head piece. 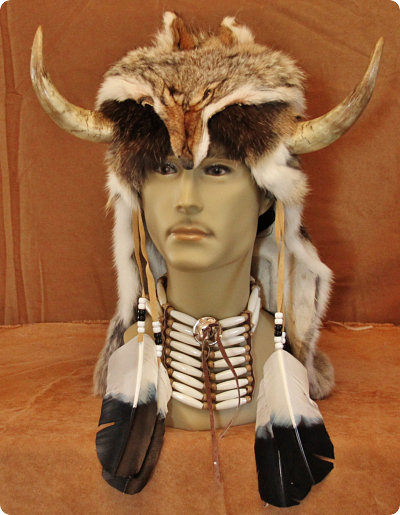 This medicine man head piece is made out of natural horns (dyed black), rabbit skin and coyote tails! The head piece is adorned with hand selected brown coque feathers and bead work. This is a hand crafted imitation (this product is not indian made) native american indian medicine man head piece. This medicine man head piece is made out of multi-color rooster feathers, natural horns, horse hair, rabbit skin and coyote tails! The head piece is adorned with arrow heads and bead work. This is a hand crafted imitation (this product is not indian made) native american indian medicine man head piece. 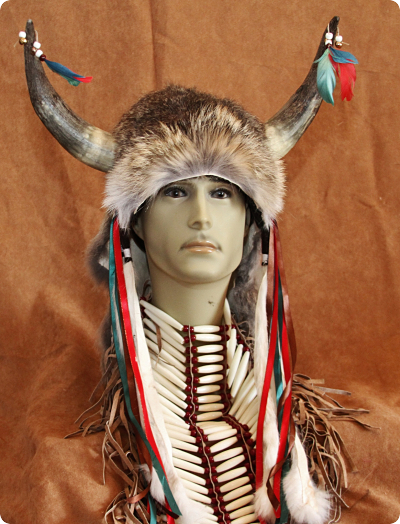 This medicine man head piece is made out of natural horns, rabbit skin and comes with a double 4 foot trailer. The feathers are hand selected white imitation eagle with black tips. The head piece is adorned with red and white trimmings and bead work.